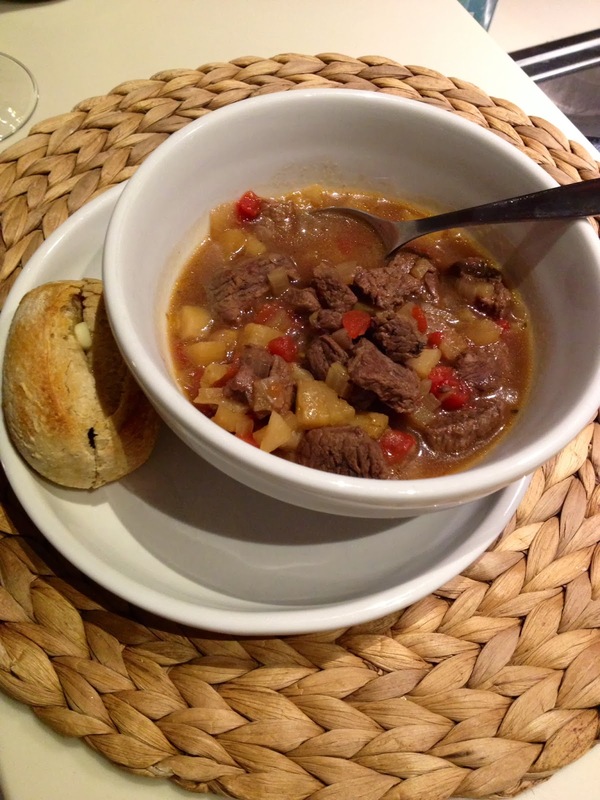 heather & olive: never-ending-chicago-[and new england]-winter beef stew. never-ending-chicago-[and new england]-winter beef stew. Ahhh, winter. I love you so much when you're surrounded by the magic of the holidays, but come January and February, your presence becomes a lot less enjoyable. I seriously start to hate you. What better way to deal with the polar plunge than busting out the slow cooker and whipping up some comfort food? (You know, other than going on a tropical vacation.) This past weekend I made my most favorite slow cooker recipe--since getting my Cuisinart for Christmas, I tried this recipe and this one (via Pinterest), and I was not in love with either. But I had made Stephanie Izard's "Never-Ending-Chicago-Winter Beef Stew" before, so I knew it was a guaranteed winner. Now, a couple of caveats: it takes a little while to prep. There is a lot of chopping involved, but you can cut corners by buying cored pineapple, etc. Which brings me to my second point: the ingredients are a little weird. Apple? Pear? Fish sauce? What? But trust me that while this is not a traditional beef stew, it is delicious. And the recipes makes a bunch--I have two tupperware containers in my freezer right now waiting for next (or continued?) deep freeze. In a large soup pot, heat 1 tablespoons oil over high heat. Season half of the beef with salt and pepper and add into pot. brown the beef and remove. repeat with other half of the meat, removing and setting aside. Add another tablespoon of oil to the soup pot and lower the heat to medium. Add the in onion and garlic and sweat them by cooking until the onion is translucent, about three minutes. add in the pineapple, pear, apple and wine and simmer to reduce liquid by half. [At this point I transferred everything to my slow cooker]. Add back the beef along with the broth, cider, tomatoes, fish sauce, Worcestershire sauce, vinegar, mustard, and sambal and bring to a boil. Reduce the heat to simmer. taste liquid and adjust with salt and pepper. Cover, and simmer until the beef cubes fall apart easily when poked with a fork, a little over four hours. [I cooked on low for 5 hours]. Adjust the seasoning before serving. The pineapple works to break down the beef, so what you're left with is incredibly tender, fall apart chunks that are beyond delicious. Serve with bread, mashed potatoes, or pasta and winter just might seem a little more doable. This looks awesome - I need to print! I am legit addicted to my slow cooker. Love it! It is my favorite thing in the winter to cook with.